CAP works with the whole school community. Most of our work is in primary schools but we also have a nursery, special educational needs and teenage programme. CAP operates a rolling programme with different, repeat visits every 18 months to build on the messages taught. 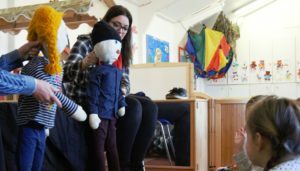 Through the use of drama, puppets and discussion the project provides children with the ability to recognise unsafe situations and the confidence to act to protect themselves. Working in whole class groups, our team of trained facilitators focus on children’s rights to be Safe, Strong and Free and explore potential assault situations. We offer a parents’ workshop before we come in to work with the children. During this session we explain what will be covered in the children’s workshops so that parents can support this learning at home. We also explore the concerns that parents have for their children’s safety and share ideas with each other on how to approach this sensitive subject with our children. CAP also provides a staff workshop prior to the children’s sessions in order to make sure that everyone is confident around Child Protection issues. We focus on the reality of child abuse and how to recognise signs a child might be showing if they are suffering abuse. We teach skills to know how to manage this sensitive situation and access help for a child.